I've only read one other book by Michelle Griep, and I liked it well enough to keep a watch on her name. The Captive Heart released in October, and I finally had a chance to read it. I'm so glad I did! Here's a short blurb and we'll chat on the other side. The Captive Heart was one of my favorite novels in some time. Maybe because Griep did such an amazing job of sweeping me straight into the wooded colonies and the struggles occurring there. At times I felt more as if I was watching a movie than reading, and that only enhanced my enjoyment of this book. I fell in love not only with the setting, but with these two characters--three if you count Samuel's daughter, Grace. Samuel was such a strong male lead, and Griep balanced that strength with emotion that only served to deepen his character on every page. Adding Eleanor into the mix, a woman who only rose to the challenges placed in front of her, made this book a story I didn't want to put down. The plot was well paced, the story elements organic, and the ending...well one that definitely delivered a sigh-worthy smile. 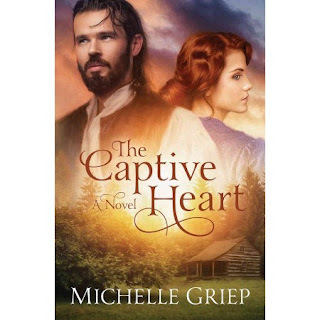 I happily recommend The Captive Heart, and you can purchase it here.